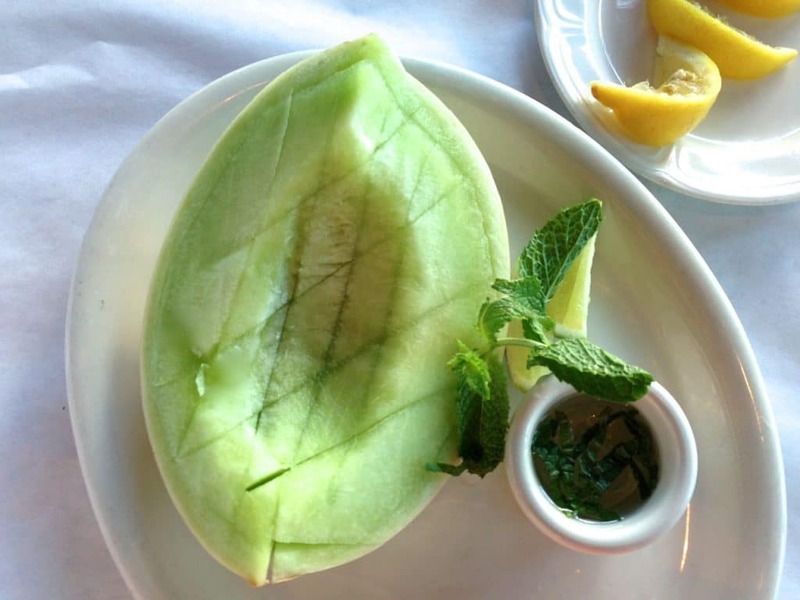 Melon with fresh mint syrup makes a beautiful and delicious morning! The fresh mint syrup is a simple way to make your melon special. Add lemon or lime wedges for that all-important squeeze of tartness. My parents were always big proponents of the thank-you note. My dad would say you don’t need fancy stationery; his favorite paper was his yellow legal pad (yes, he was an attorney), and his rationale for his stationery was that in its humility, it elevated the words by letting them stand out above all, expressing even greater depth of the expression of your sentiment. I can’t say I opt for the legal pad too often for correspondence (I’m such a fine paper hound), but the words, I agree, are the most important thing. They begin and end with what I want to say today to you: thank you, a million times thank you for your great enthusiasm for this special community at Rose Water & Orange Blossoms, for cooking and eating our beloved Lebanese recipes, and for encouraging me on this path with your votes a couple of months back in the Saveur Best Food Blog Awards contest. 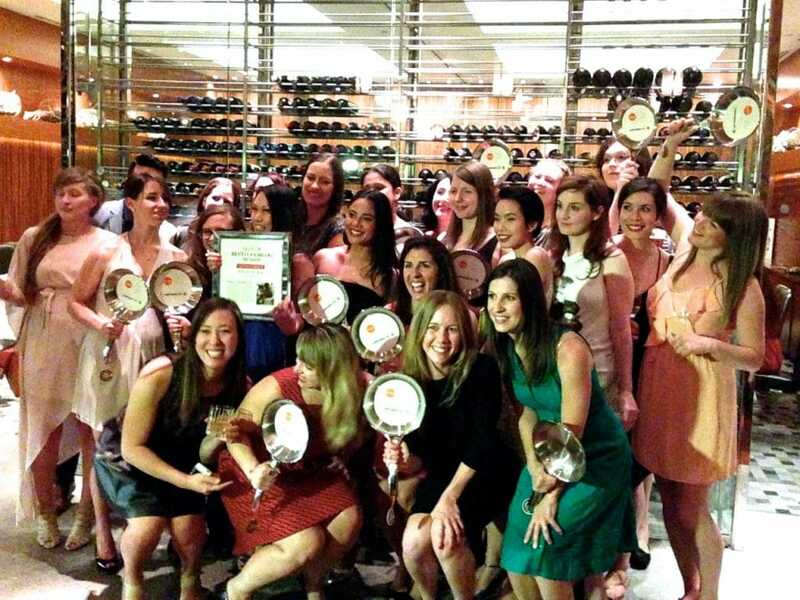 I just returned from a whirlwind couple of days in Las Vegas, where Saveur hosted the group of food bloggers receiving their Best Food Blog awards. The awards are a terrific honor, and the trip? Unheard of. Most of the time we are working in rather solitary environments, the creative and often upside-down worlds of our kitchens strewn with props and cameras and lighting equipment, along with simmering pots and rolling pins and flour (the camera lenses’ worst enemy!). Even the most famous bloggers among us don’t often get wined and dined and gifted with kitchen bling the way we did out in the desert last week. I came away with an affirmation of the respect I already had for my fellow food bloggers, each of us with a different passion that motivates us to do what we do despite the risks to career and pocketbook. I also came away with a newfound respect for one of if not the greatest of the Las Vegas hotels, the Bellagio. We were toured “where no visitor has gone before”—that is, behind the scenes in the Bellagio kitchens where the best dim sum chefs hail from China and exceptional pastry chefs from France to make every last morsel served in the hotel…from SCRATCH. And where a master sommelier took us on an “art and wine pairing” tour of the hotel’s museum of fine art. Now that’s a museum tour I’ll take any day! Our hosts, in addition to the hotel, included revered brands like Le Creuset cookware, Highland Park whisky, and Talenti gelato (yes please!). What do you award a food blogger with? Not a statue, no. A frying pan, of course, inscribed for the occasion. Then, there was a parting gift of another sort. One of my favorite Chicago restaurants, Mon Ami Gabi, has an outpost in Vegas. 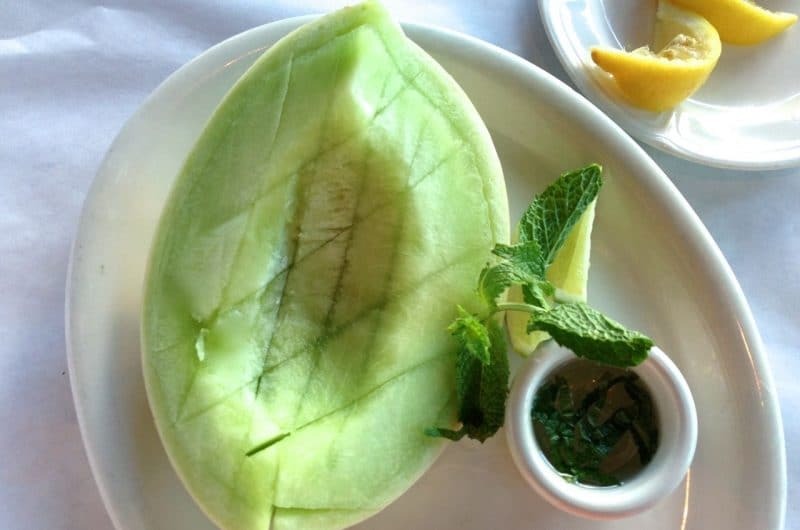 A quiet wind-down breakfast there before heading back to Michigan included a subtle plate of melon with mint syrup. Subtlety had not been on the menu all week long; that was so much fun. And all the more reason this plate grabbed my attention. Our Lebanese love for fresh fruit and our na’na, our mint, found a lovely expression here against their backdrop of a plain white plate and paper-lined table. I share them with you as my note of thanks; the good, sound flavor of gratitude on a quiet sheet paper. The mint simple syrup can be made ahead and kept in a jar or other airtight container in the refrigerator for several weeks. In a small saucepan, combine the sugar and water and bring them to a boil over medium heat. When the sugar is fully dissolved, boil for another 3 minutes. Remove the syrup from the heat and stir in the mint. Cover, and let the syrup steep for 30 minutes. Strain and discard the mint. Serve the melon, cut however you like, with the syrup and a squeeze of lemon or lime juice, garnished with mint leaves. 18 Responses to "Melon with Fresh Mint Syrup, a thank-you note"
Maureen, your words and sentiments are tender and sweet, just like melon with mint syrup. Congratulations to you and glad you enjoyed the trip, I am glad our votes helped. Keep up the good work cousin, and of course the photo’s as well. There is a batch of fresh mint steeping on my stove thanks to your recipe today. The kitchen smells amazing!! Wishing all the continued best to you Maureen!! Maureen, thank you for sharing your wonderful experience at the oasis in the desert. I know I join so many of your other readers who are just absolutely delighted that you and your gorgeous and enticing blog were honored in such fine fashion. Soak it all in, Maureen. Believing in your dream–and so much hard work–is paying off. Thanks so very, very much, Mr. McGrath! Mareen ,Congratulations from a devoted reader in Australia. Your stories,writing and recipes are inspiring. I am an Australian born Lebanese and I love your blog. Keep up the beautiful work. Nola, how kind and wonderful, thank you! Please keep in touch! Great seeing you today at Ben’s party. OK, how much weight have you lost on low charbohydrates? You look MARVELOUS!!! Terri, so nice seeing you too! And thanks for that–feeling great in every way! Congratulations, Maureen. Your Dad would be so proud. I cannot wait for your cookbook. Thank you so much for mentioning Dad in that way! What a lovely way to enhance melon, without overwhelming it. Very very summery. Ha, just the other day, I’ve read on another blog about a refresher, mint with lemon.. it looks like mint is a favorite amongst many bloggers. It’s wonderful you had an amazing time @ the Bellagio. I cannot wait to pay a visit there soon in the future. Thank you! Yes, mint is the best!! Maureen, congratulations! I am a Lebanese-born New Yorker. My kids and I love Lebanese food and we’ve tried several of your recipes. Your stories remind me so much of my Sito Julie and how she used to cook in her kitchen back in Beirut. I am so glad all your hard work and talent is paying off. Syma, Sito Julie’s kitchen in Beirut sounds so special. Thank you for all of your kind words and I’m so happy you are making and enjoying my recipes!